Overeaters are compulsive about their eating and they eat mindlessly and without the triggers of hunger signals from the body. 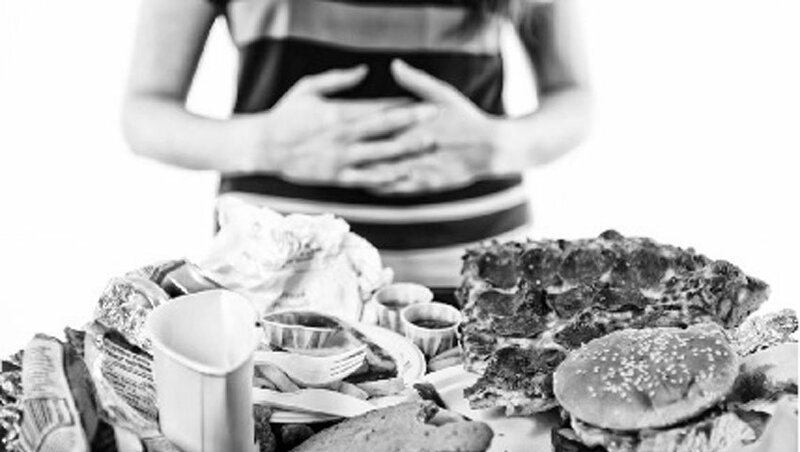 Can I Control Overeating When I Feel Completely Out Of Control? As a human being, we need a certain amount of calories, which are units of energy, to keep our body functioning on a daily basis. In adults, this calorie requirement will vary based on their age, weight, activity level and their gender with the more active and younger you are, the more calories you need a day to maintain your weight. Typically, males will need more calories per day than women because they have a larger body mass. Male calorie intake will range from about 2,000 to up to 3,000 calories per day with the latter only for those who are very active. For women the range is between 1600 to 2400 calories per day, again with the larger number representing younger, very active women. When people eat above their recommended calorie range based on age and activity, the will gain weight. Eating below that range will lead to weight loss over time, but not on a daily basis. The body is naturally designed with a "checks and balances" system of hormones and chemicals that trigger feelings of hunger, causing us to eat, and feelings of satiation, causing us to stop eating. Over time, overeating can actually become a pattern of behaviour that may actually cause maladaptation of the natural checks and balances in the body that control food intake. Some medical conditions can also cause trigger excessive hunger and lack of satiation, although these are often a result of overeating for long periods of time and not often the specific cause. Many people who become overeaters find they are constantly eating without even thinking about eating. They have a dish of candies beside the computer, grab a bag of crisps to eat while watching television or stop at the fast food restaurant whenever they are in the car. They are not eating because they are hungry; they are eating because of one or more of several other factors. Overeaters are compulsive about their eating and they eat mindlessly and without the triggers of hunger signals from the body. The foods that overeaters tend to be attracted to are high in fats, sugars and salts, the sweet and savoury combinations are a major issue. These foods, besides tasting good, also alter our brain chemistry. They stimulate those feel-good chemicals in the brain, giving us both an energy boost as well as a brain fix, virtually the same way that alcohol and drugs interact with the brain. Overeaters may feel bad about eating unhealthy foods, suffer from depression, low self-esteem, anxiety or stress and, because it works, they turn to food again to get that feel-good feeling. The resulting cycle of eating and feeling bad leads to weight gain and, over time, obesity and increased health risks. Counselling, education and nutritional training can be used to very successfully treat issues with overeating. Individuals will deal with the root cause of their eating while learning how to control and manage their food urges and develop a healthy lifestyle.